There has been a lot of backlash and disappointment expressed towards the newest revealed Metroid game- Metroid Prime: Federation Force, a multiplayer arena shooter that was revealed exclusively for the Nintendo 3DS at E3 this year. One part of the disappointment stems from the fact that the game will not star series heroine Samus Aran, and will instead on other characters. However, speaking to Eurogamer, Metroid Prime series boss Kensuke Tanabe defended the decision. “[Metroid Prime: Federation Force] is an attempt to expand the Metroid universe,” Tanabe told Eurogamer during an interview conducted at E3. “As you can play with up to four players it wouldn’t make sense to play as four Samus characters! It’s not just narrative reasons, either- he also pointed out that it will have gameplay advantages as well. “You have the option to choose load-outs for you to bring to the battle,” Tanabe continued. “However, you have to consider that there will be limitation for how much can carry as a character. All of this makes sense! Really, it does. But does he not think that it might have been best to just label it as a new IP? The bulk of the negative reaction could have definitely been avoided that way. “I’ve always been thinking about having a battle between the Galactic Federation and Space Pirates,” he continued. “The Metroid Prime series fits between Metroid 2 and Super Metroid, as you may be aware. So it falls under that same timeline, but looking at it from a different perspective. [And]- you may be able to see Samus in the game…” Tanabe teased. He’s not the only one defending the game from the vitriolic backlash, either. Nintendo of America head honcho Reggie Fils-Aime has said that a lot of the backlash against the game is misguided. “What the fan at home saw was something in the Metroid Prime universe that they weren’t expecting. The reaction has been negative. There’s no sugar coating it,” Fils-Amie said previously. 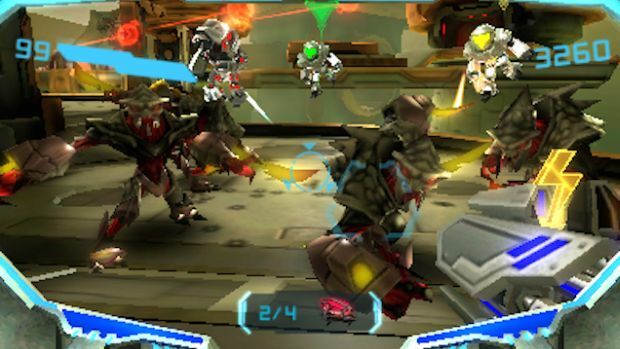 Metroid Prime: Federation Force launches on Nintendo 3DS.